Maybe the best hostel I have ever stayed. Everybody is really helpful, the location is great and it’s really clean. Here you see how good a hostel could be! We will not forget about mar, she was the best! She is helping you with everything on such a nice way! But don’t make the mistake and play ping pong against her, in the beginning you think you have a chance, but you don’t! Thanks for the great time in Cusco! Best hostel I ever stayed in! Amazing staff, great food, cool activities, still quite enough to sleep, they even give you free earplugs!! 10/10 would recommend! Súper nice Place! Its huge and you meet lots of People there! 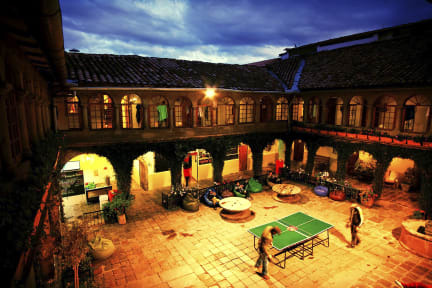 The hostel has different activities every day and the staff is super friendly. They know how to keep their guests motivated. One of the nicest things here is that it is super clean!! Loved our stay there. Wir kamen hier vor ca einer Woche an und fühlten uns vom ersten Moment an wohl. Die Lage ist ziemlich zentral (ca. 5 Gehminuten vom Marktplatz entfernt) und wir konnten all unsere Touren bequem vom Hostel aus planen. Die Mitarbeiter waren alle motiviert und zuvorkommend, vorallem Gisele und Wendy halfen uns bei den Planungen von unseren Touren (Free Walking Tour, Machu Picchu,...). Es gab jeden Abend Partys und Turniere (beer pong, Fußballtennis, Tischtennis,...). Alles in allem empfehlenswert. I had a really great time in the hostel. I can definitely say that the staff was one of the nicest, especially Wendy! Thanks to the whole Pariwana team for a great stay! Super nettes und aufmerksames Personal. Betten sind bequem die Sauberkeit an sich in Ordnung. Frühstück gut und ausreichend (lactosefreie Milch etc. ;)). Jeden Abend anderes Programm von Beerpong zu Karaoke und BBQ. Alles ganz zwangfrei und ab 22 Uhr ist im Innenhof auch Ruhe und es geht im Schallgeschützten Raum weiter. :) Recht zentral. Alles zu Fuß zu erreichen. Sicherheit top. it‘s a party hostel. If you like it, go for it. It's a huge hostel and we prefer smaller ones, but it's really good for its size. Especially the beds and the breakfast were great! Comfy beds, nice blankets, plugs inside of the lockers, really good breakfast- bigger variety, good activities going on, super friendly staff knows your name, well equipped kitchen, close to the main attractions and market, good WiFi. However don’t book with the agency at the hostel overpriced. Would stay here again. Unfortunately, no water refill.